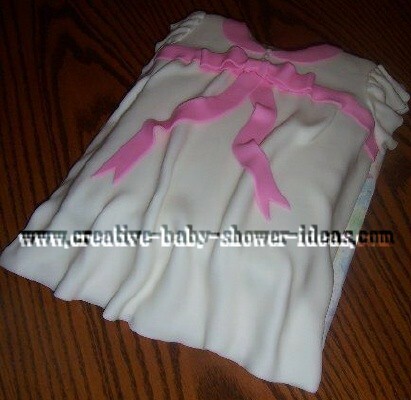 Creative baby shower cakes are easy to make with the pictures and ideas shared by our readers. This section has dress cake pictures. More cake designs can be viewed through the link to the main index below. Enjoy! Why pay full price if you will only use the pan once or twice? Great selection! Chances are if the pan exists, you will find it on eBay. This is a chocolate cake, iced in cream cheese icing and covered with fondant icing. I used a 9 X 13 sheet pan to make this cake. I used a drinking glass to cutout the neck, and frosted the entire cake with cream cheese icing. I then rolled out some fondant icing to make the dress and sleeves. I colored some more fondant icing pink to make the bow and collar and used edible pearls as buttons. 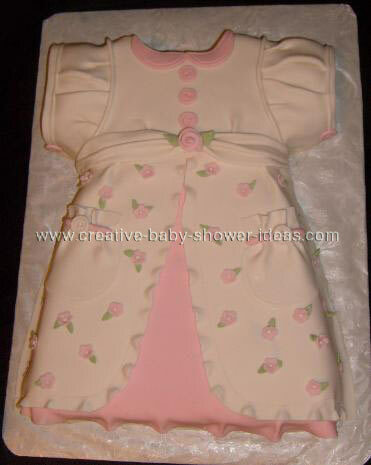 The baby dress was a half sheet pan trimmed and iced in buttercream there are royal icing flowers and fondant accents. This cake is very easy to make.